Finally! We were all together in Portland! With the help of technology, the new fundraising show “Oh, Those Gershwin Boy!” was put together even though everyone involved lives in different cities. It was a memorable month of performances, and our afternoon at Lewis & Clark College in Portland was especially memorable to me. I had not performed on the campus since I’d graduated nearly 40 years earlier! I know I am dating myself, but it is what it is! Being back in the extraordinary Agnes Flanagan Chapel was such a thrill. At times it felt as though I were 21 years old again; transported back through time to my college years at Lewis & Clark. Then, mid song I would open my eyes and see all the smiling faces just beyond the lights. Seeing all the friends and family members, I knew I wasn’t in Kansas any more! At the end of concert everyone clapped in rhythm for our encore… I don’t ever remember that happening before at any show and certainly a moment to remember! 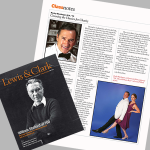 I had to chuckle when they initially told me about the “Crooning the Classics for Charity” article in the Lewis & Clark Chronicle Magazine. What’s there to write about? 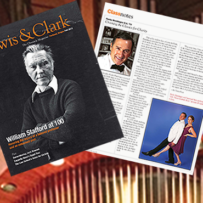 And then I remembered, oh, I’m no longer that college kid going to class and singing in the choir, I’ve been out living life for (mumble) years, and perhaps Lewis & Clark alums may find the work I do, creating fundraising musical revues, an interesting read. Pattie Pace did a terrific job on this well-written article. I was so pleased she placed such emphasis on my desire to raise money for charity; highlighting the fundraising shows that continue to move me toward my goal – To raise 1 million dollars! I’m nearly half way there. The afternoon at the Agnes Flanagan Chapel was made even more special by the fact that it was my mother’s 87th birthday. At the end of the concert the orchestra played and the audience all sang happy birthday to her. Little did I know that she would leave us less than four weeks later, so that memory of singing to her and seeing her wipe a tear from her eye will be with me forever. 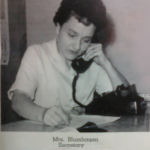 She was such a darling mother and I miss her dearly. 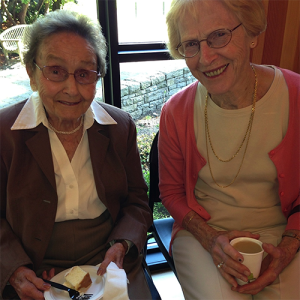 My darling mother, Eleanor Blumhagen (left) after the Gershwin concert at Lewis & Clark College on her 87th birthday. Elsie Williams (right), is the widow of Jack Williams, my first high school music teacher. In the the summer of ’42, at the age of 16, my mother laid eyes on a handsome fellow, a hired hand working in her father’s golden wheat fields near Milton-Freewater. From the moment she first brought lemonade to my dad, it was love at first sight. Otto Blumhagen had stolen her heart. Three weeks later he was drafted and they were apart until dad’s return early in ’46. Within the year they were married. My mother adored flowers and had a knack growing them. In fact, both of my parents shared a love of the land and believed in the preservation of the Walla Walla Valley. It seems fitting that they would have first met where they did. Those wheat fields will always hold a very special place in my heart and the hearts of my family.